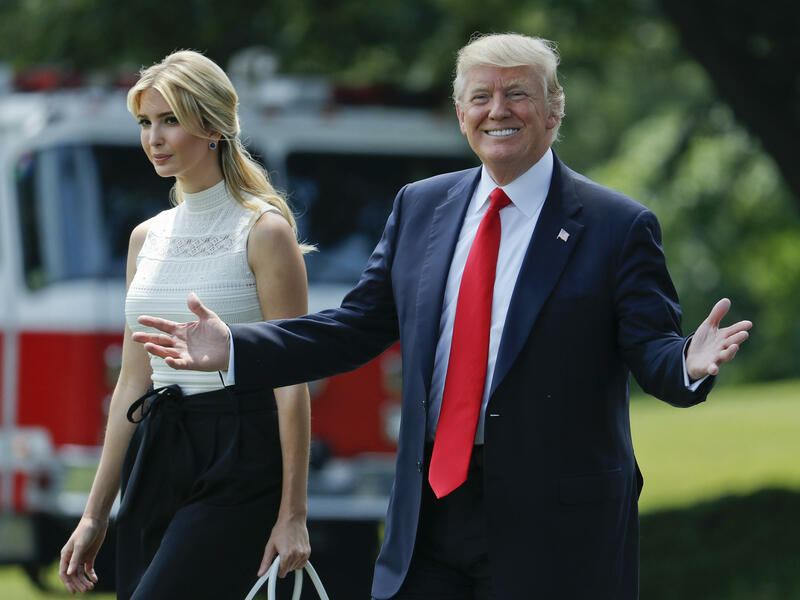 President Trump with daughter Ivanka Trump on the South Lawn of the White House in Washington last month before boarding Marine One. An opinion piece by Ivanka Trump published on Wednesday calling for national paid family leave has drawn criticism from a former Obama administration official who says it ignores that Democrats have long pushed for such a measure over objections from Republicans. Writing for Fox News, the first daughter, who is also a White House adviser, notes that as a candidate her father proposed guaranteeing six weeks of paid maternity leave in what The Washington Post acknowledged at the time was "a striking departure from GOP orthodoxy." "[Over] the past 21 months, we have witnessed conservatives building a majority in support of this important policy," she wrote. "In conversations with members of the GOP, there is burgeoning agreement on the intrinsically conservative nature of a national paid family leave plan," she said. "If executed responsibly, paid family leave is targeted government action with the right incentives — designed to increase the independence, health and dignity of our citizens," she wrote. The article appeared ahead of a bipartisan gathering of lawmakers on Capitol Hill to discuss paid family leave. The article prompted this response from Chris Lu, who worked for President Barack Obama as White House Cabinet secretary, and later as deputy secretary of labor: "Democrats have led the way on #PaidLeave for years. The FAMILY Act by @SenGillibrand and @rosadelauro is supported by a wide range of stakeholders including business leaders." In a subsequent exchange on Twitter, Ivanka Trump answered, "This is true. ... Both sides need to come together on a solution that can garner the votes be signed in to law." Lu said he would "give her credit for responding and acknowledging Democratic leadership on #PaidLeave." "As you know, it takes two to tango," Trump responded. Lu said: "With complete sincerity, I'd welcome the chance to sit down and share ideas on expanding paid leave, either through legislation or business adoption. Helping families shouldn't be a partisan issue. DM me and let's set something up." The 2013 FAMILY Act sponsored by Gillibrand would allow for up to 60 days of paid family leave and would establish an Office of Paid Family and Medical Leave within the Social Security Administration. Ivanka Trump has reportedly been working closely with Florida Republican Sen. Marco Rubio on a "budget-neutral approach to parental leave" that would give parents the option to draw from their Social Security benefits to fund parental leave, but then require them to delay their retirement benefits. In an opinion piece published in The Washington Post, Elizabeth Bruenig wrote in February, "The proposal would penalize bigger families more than smaller ones; couples with more children would face working further into old age before receiving retirement benefits. Moreover, it would likely mean that lower-wage workers would end up putting off retirement longer than wealthier workers with ample company benefits, an especially perverse outcome given that America's poor suffer significantly reduced life expectancies compared with the country's rich."